The Democratic Party of Georgia is the affiliate of the Democratic Party in the U.S. state of Georgia. It is one of the two major political parties in the state. It is chaired by Nikema Williams. For over a century, the Democratic Party dominated Georgia state and local politics. From 1872 to 2002, the Democratic Party controlled the Governor's Mansion, both houses of the state legislature and most statewide offices. 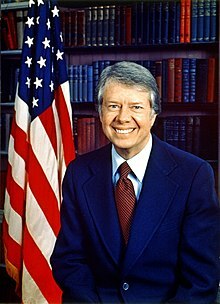 In 1976, Democratic Governor Jimmy Carter (1971-1975) was elected the 39th President of the United States. After switching to the Republican Party in 1998, Sonny Perdue went on to defeat Democrat Roy Barnes in the 2002 gubernatorial election. Perdue's unexpected victory marked the beginning of a decline for the Democratic Party of Georgia. Georgia House Speaker Tom Murphy, the longest serving Speaker in any state legislature, lost his bid for another term in the state House. Four Democrats in the Georgia State Senate changed their political affiliation, handing the upper house to the GOP. And in 2004, the Democratic Party lost control of the Georgia House of Representatives, putting the party in the minority for the first time in Georgia history. The Chairman of the Democratic Party of Georgia is Nikema Williams. Porter was elected in August 2013 via special election and was reelected in January 2015 to serve a full four-year term. In 2019, First Vice Chair Nikema Williams was voted to succeed him. Seven individuals—Chairman DuBose Porter, First Vice Chair Nikema Williams, Wendy Davis, former state AFL-CIO President Richard Ray, Sally Rosser, State Representative Pamela Stephenson and former state Democratic Party Chairman David Worley—were elected to represent Georgia on the Democratic National Committee. Five Democrats represent Georgia in the United States House of Representatives. The Democrats do not hold either of the two United State Senate seats. To date, the last Democratic senator from Georgia was Zell Miller, serving from 2000 to 2005. The Democratic Party of Georgia controls none of the fourteen state constitutional offices. The Democrats control 20 of the 56 senatorial seats and 63 of 180 state house seats. Two-year terms of office apply to both houses, and the entire membership of each body is elected at the same time in even-numbered years. Since 1948, the Democrats have secured the state of Georgia 7 times, while the Republican party secured Georgia 8 times. However, during the past 6 presidential elections, the Democrats won the state of Georgia only once, in 1992. Bill Clinton won 43.47% of the vote while incumbent President George H.W. Bush carried 42.88%, while losing his quest for a 2nd term. ^ "Charter of the Democratic Party of Georgia" (PDF). Democratic Party of Georgia. Archived from the original (PDF) on 2010-11-22. ^ "Officers". Georgia Democratic Party. 12 July 2016. Retrieved 1 April 2018. ^ "Caucuses". Georgia Democratic Party. 11 July 2016. Retrieved 1 April 2018. ^ "DNC Members". Georgia Democratic Party. 6 February 2017. Retrieved 1 April 2018.